Allergic Fungal Sinusitis (AFS) is a common allergic reaction, which occurs in the sinuses of people with a compromised immune system (patients with diabetes or aids).There two different forms of invasive fungal sinusitis varying in severity: acute invasive fungal sinusitis, and chronic invasive sinusitis. While acute invasive fungal sinusitis is the most serious and severe condition, it is important to discuss the both forms as all their associated problems still manifest themselves in harmful ways. In chronic invasive sinusitis a thick fungal debris and mucin develops in the sinus cavities from the bacteria Aspergillus. Unfortunately the only way to remove this sometimes painful debris is through surgery. 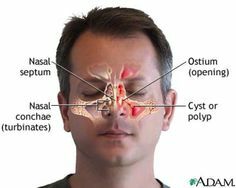 Symptoms can also include a thickening of mucous consistency, bone destruction, and fat stranding outside the sinuses. Anti-inflammatory treatments are often necessary to reduce the reoccurrence of the fungal debris after it has been removed. As with all treatments finding one that is from a natural source that is effective can be challenging. This is where Manuka honey comes in. In a randomized control trial, Thamboo and associates created a Manuka honey nose spray which they tested on 34 patients with diagnosed AFRS. The results showed that 9 of the 34 people responded to the treatment and they indicated that they had improvements in their symptoms while receiving the honey spray. Although it didn’t show that that their was a global improvement of the disease itself it did reflect that some patients showed significant positive responses and opened the door to further research on Manuka honey’s use in the treatment of AFS. Deshazo, Richard D. “Syndromes of Invasive Fungal Sinusitis.” Medical Mycology 47, no. 1 (May 19, 2008). Accessed June 13, 2016. http://mmy.oxfordjournals.org/content/47/Supplement_1/S309.full.